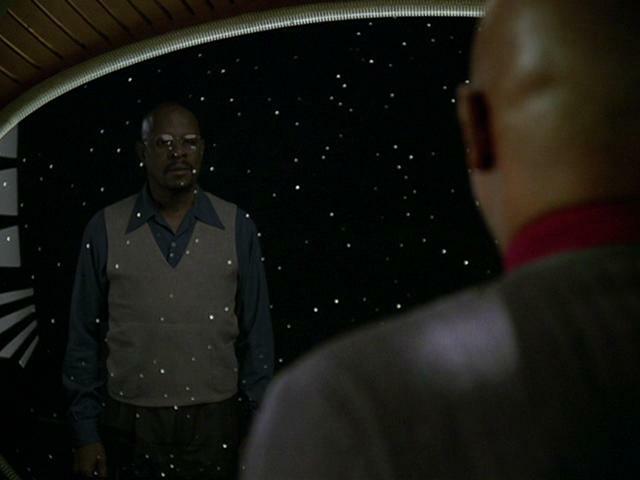 We continue “Trek Requests” with “The Inner Light,” hands down one of the best stories to come out of “Star Trek” and “Star Trek: The Next Generation” that really highlights the high concept sci. fi. ideas that the show could bring and explore while giving us the chance to explore an entire new culture and civilization as well as the man of Jean-Luc Picard. “The Inner Light” was directed by Peter Lauritson with the teleplay and story by Morgan Gendel and Peter Allan Fields as the other co-writer of the teleplay. The story involves the Enterprise-D investigating a probe that is following them that sends Captain Picard into sleep. When Picard awakens he finds himself as the man Kamin in the community of Ressik on the planet of Kataan. From here he seeks to figure out the nature of the state he is in and if it is real, while his crew tries to get him out of the state that was brought about by a beam from the probe. The Pros: First Contact – When Picard wakes up as Kamin he is fully Picard. The first thing he does is ask computer to “End Program.” He later goes outside and he questions everything. He does this for 5 years before finally accepting the reality of the life he’s living at Kamin is real but in doing so he gets all the information he can first such as when he asks Batai who he is, the planet and the town they are in. It’s powerful and shows why Picard is the diplomat and one of the smartest of the captains. He works to understand wherever he is so that first contact can go well. The Life of Kamin – Kamin’s life is a full one. He is a scientist who inspires his daughter to become a scientist, and a musician who plays the flute who inspires his son to play the flute. In both cases they are studying the ongoing drought on their world and what to do about the water supply. He is politically connected as his friend Batai is on the city council, and his youngest son he names after Batai and he is a fighter. He stands up to the Administrator about the dying of their planet and learns they’ve known for the last 2 years. After his full life with his family and wife in which he is around for the death of his friend Batai and his wife Eline he is a grandfather and his story comes to an end as the rocket is launched which was the probe that shared the story of these people with whoever would discover it. Picard and Kamin – Was Kamin fully like Picard in that the fever had made him believe he was in a Starship? Was Kamin a musician or was it Picard’s embracing of the flute to get used to living a life another that was key? The issues of identity are never fully resolved though we know Kamin had a family as they tell Picard to remember them at the end when he watches the probe launch into space. This is part of what makes the episode so good. Picard lived a full life that was both his and the life of another that gave him the glimpse into the world of a civilization that died 1000 years ago. Politics of Water – In this episode the planet Kataan is dying but those in power in denial over it, even though we learn years later that they knew all along that the heating of the planet was causing water problems. This was a great showing and not telling in regards to Global Warming as we see this same denial today by those who profit from not changing the status quo. Change is hard even if the status quo is difficult with water being rationed (Like in California currently). This was one of the great moments in the episode where the trials of an alien species mirrored our own and were ones that we could relate to. The Crew of the Enterprise-D – The crew is very involved at the beginning with Geordi, Worf, Data and Riker having lines about the probe before Riker catches Picard before he falls. We later see them stop the beam and reestablish it when Picard begins to die. Beverly is on the bridge during this time trying to help resuscitate Picard but to no avail. The scenes are powerful on the bridge since the crew is powerless and can’t do anything while their captain is going through an experience they have never dealt with before and know nothing about. Remembrance – A huge theme of this episode is Remembrance, which is what we see when Kamin’s family talks to Picard at the end. The probe was sent out so their people would not be forgotten as the civilization knew it would be dead by the time the probe reached anyone. From this though they found hope in being remembered and did it by sharing Kamin’s life and the memories of their people. 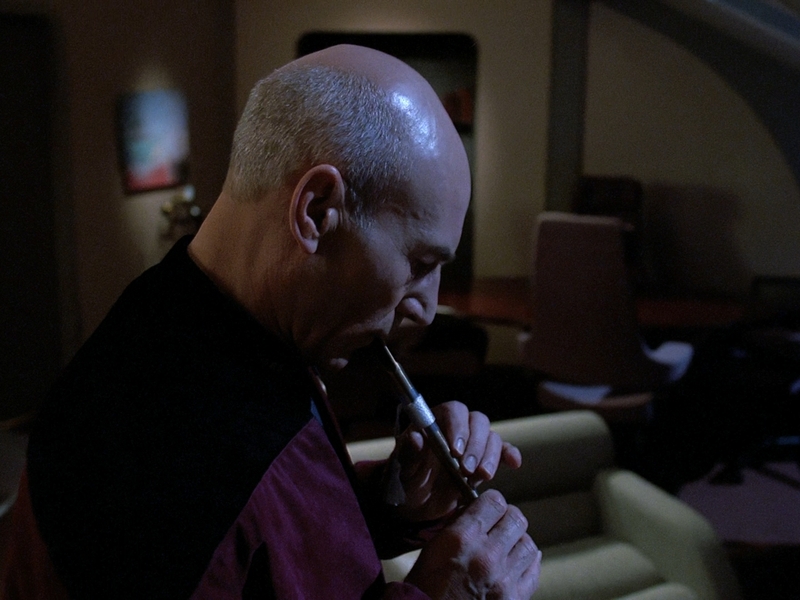 The experience is so powerful that Picard learns how to play the flute while there and when he returns and receives the flute in the probe plays a song to remember the life he lived with the people who are no more. The Message – There were quite a few messages in this. Not ignoring a problem until it becomes impossible to deal with (the heating of the planet and water usage in the case of the Kataan), and the importance of remembering the past and those who have gone, cause even though no civilization and culture are perfect we can still take the good from the past and apply the lessons from it to the future. This episode is everything that is great about “Star Trek.” It’s a meditative episode with Captain Picard living the life of another people and culture and from that experience coming to love and remember them. It’s an experience only he receives and it defines him in a way as to express himself through music and be left speechless before the crew. This profound discovery of new and new civilization (even if the civilization has long been dead) is part of why I am a Trekkie. The aliens of “Star Trek” when they are written right teach us more about ourselves and reveal our own shortcomings and strengths and with it give us the ability to empathize better, as Picard did when he became a part of a people before the probe breaks contact…and also that as long as people remember those who have been lost, they have life again in our hearts and minds. Final Score: 10 / 10. Perfect “Star Trek: The Next Generation” episode.